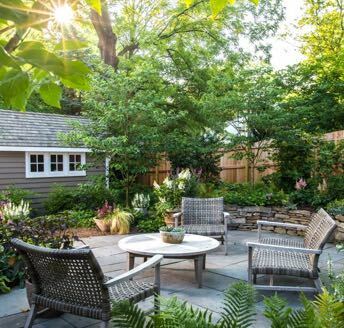 Container gardens are a great way to add color to any size garden, since they pack a powerful punch of vibrant blooms and foliage into one space. They are moveable, adjustable, and delightful additions to any garden. With summer still in full swing, now is the perfect time to create a colorful and exciting container for your home. Thrill plants draw your eye into the container, creating a focal point through height, color, bloom or texture. Spill plants draw your eye down and through the container by trailing over the edge. 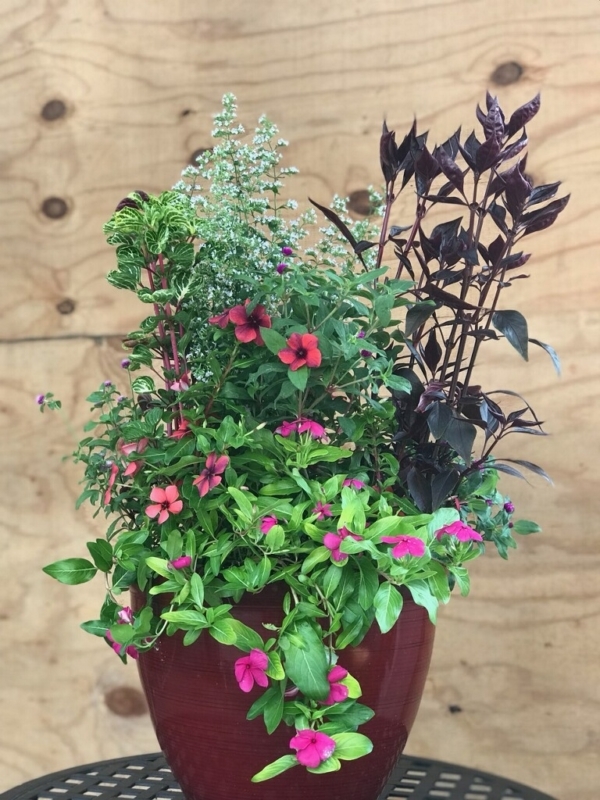 Our favorite aspect about container gardens is the customization—you can use any combination of plants that you enjoy to create one you love. Check out our step-by-step guide to creating a custom container garden, and take a look at our designs below if you want some inspiration. Of course, if you prefer to have some assistance putting yours together, our specialists are happy to help! 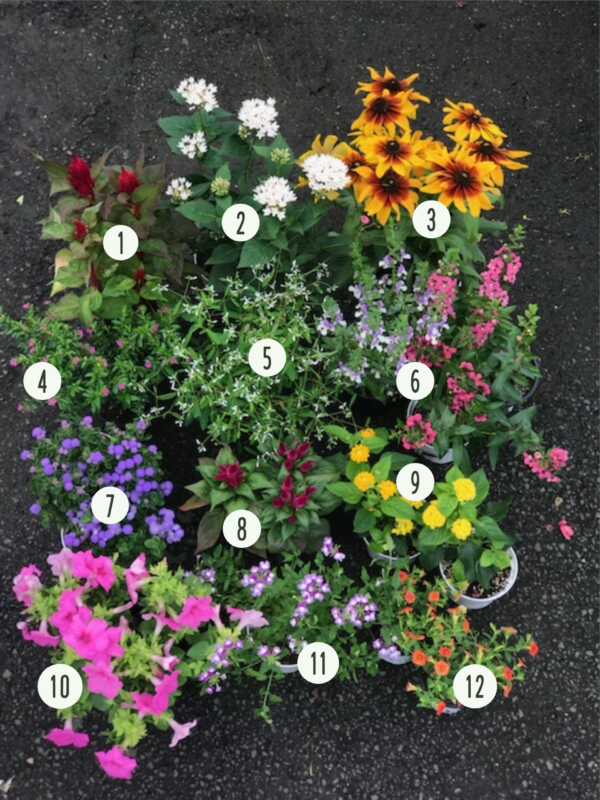 (1) Celosia, (2) Pentas, (3) Rudbeckia- annual, (4) Cuphea (Mexican Heather), (5) Euphorbia, (6) Angelonia, (7) Ageratum, (8) Celosia, (9) Lantana, (10) Petunia, (11) Verbena, (12) Calibrachoa. 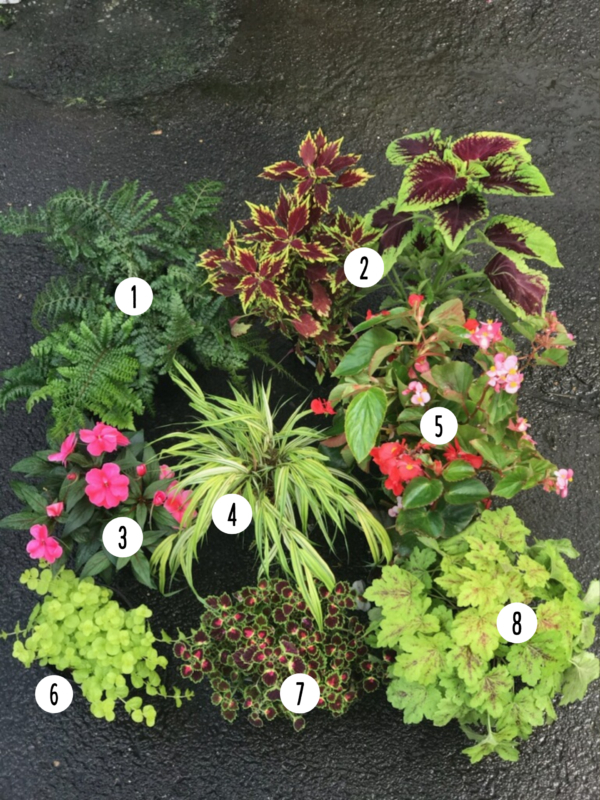 (1) Tassel Fern, (2) Coleus, (3) New Guinean Impatiens, (4) Japanese Forest Grass, (5) Begonia, (6) Lysimachia ‘Aurea’ (Creeping Jenny), (7) Trailing Coleus, (8) Heuchera (Coral Bells). Clockwise from top: Elephant Ear, Trailing Coleus, Verbena, Petunia, Trailing Coleus. 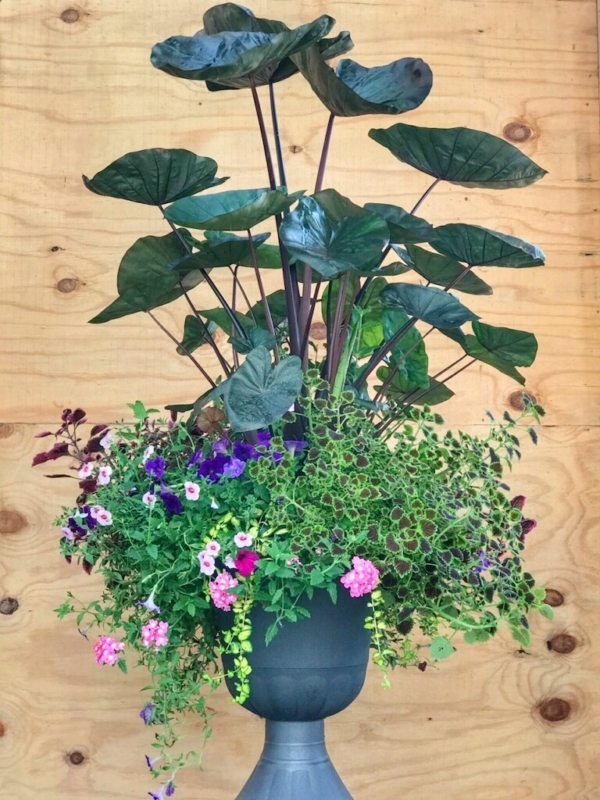 This dramatic container for sun makes a statement – elephant ears with their bold foliage and sweeping height grab attention and the vibrant colors of coleus, petunia and verbena complement it with color and blooms at the base. Add this container to any space for a tropical feel. Angelonia (top) and Creeping Jenny (bottom). 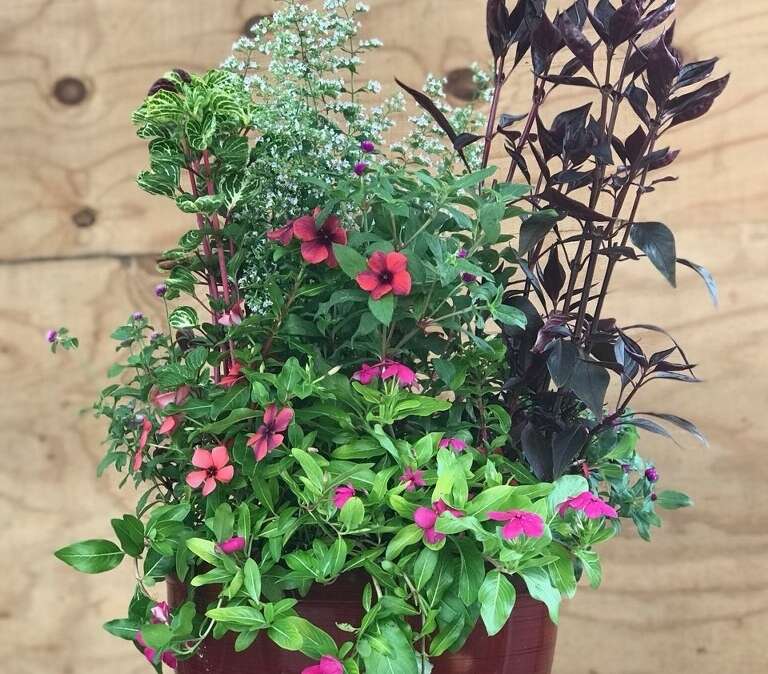 We love the simplicity of this container, which while only containing two types of plants, is still bursting with summer color and blooms. 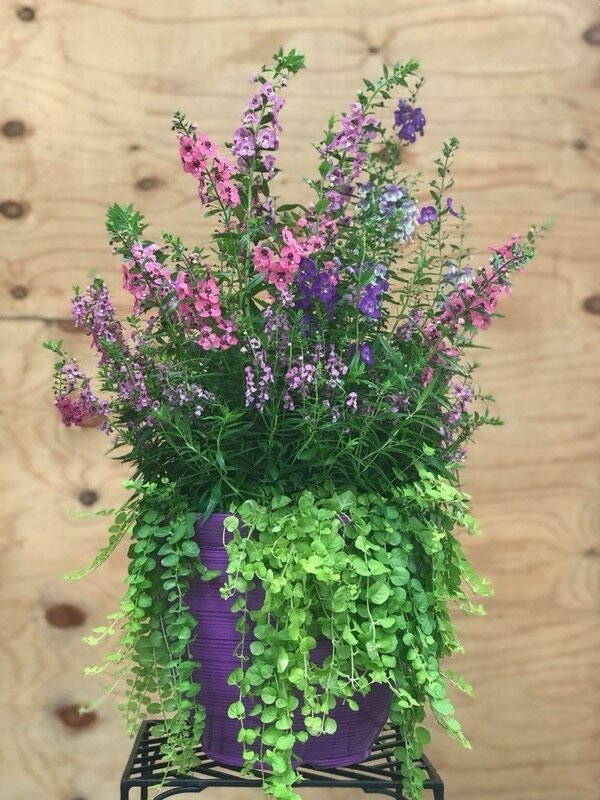 The elegant stalks of angelonia create texture and movement and the bright green of the creeping Jenny contrasts nicely with the blooms and dark green of the Angelonia. Clockwise from top: Calamint, Bachelor’s Button, Iresine (Cherry Blood Leaf), Vinca, Iresine (Variegated Heart Blood Leaf). This vibrant container is packed full of cheerful vinca and vibrant bachelor’s button. Calamint—which has a lovely scent, cherry blood leaf and variegated heart blood leaf serve as the “thrill” plants drawing the eye upwards, while the vinca trails down the sides. This container will be bursting with color all season! Clockwise from the top: Begonia, tassel fern, heuchera, Japanese forest grass. The tonal color palette and varying textures of this container will draw the eye to even the shadiest spot of a garden. 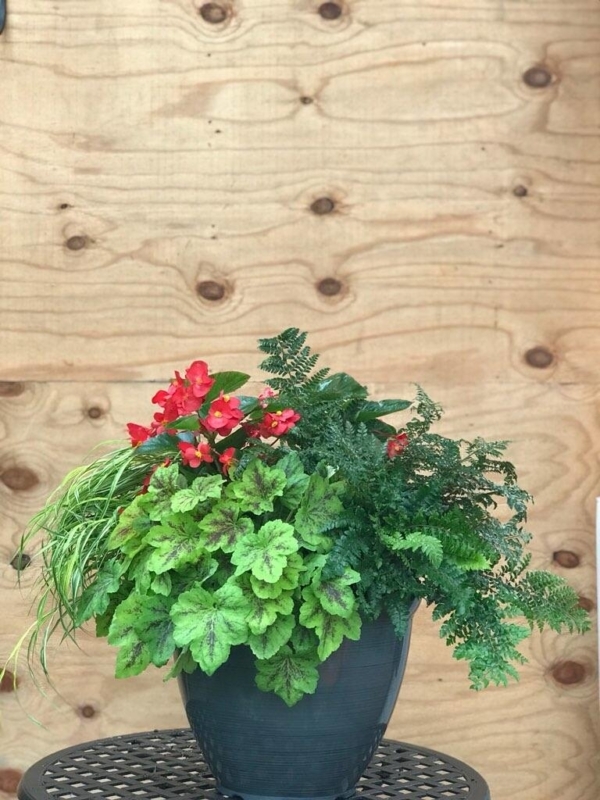 Begonia provides a pop of color, while perennial Japanese forest grass, heuchera and tassel fern provide interest with contrasting textures and shades of green. 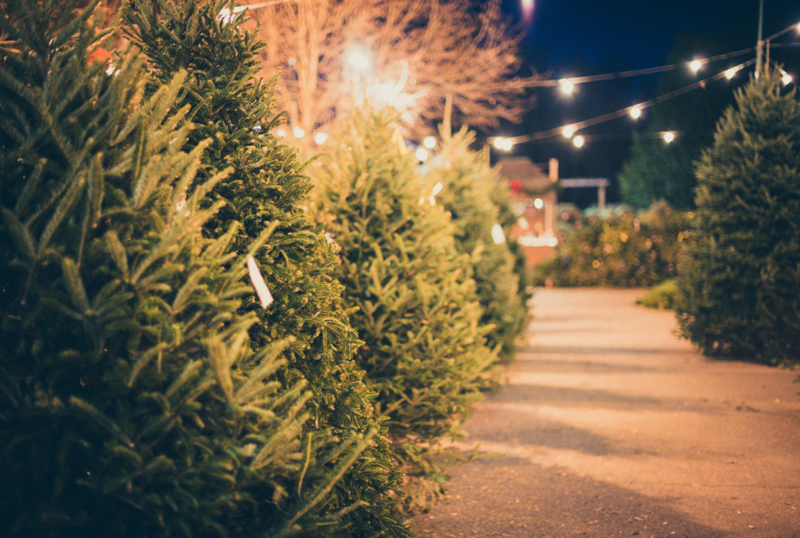 Larger containers hold water better, so bigger is better when picking your size—you will need to water less with a larger container. Since summer brings the heat, you will need to check your container for watering once or even twice per day. 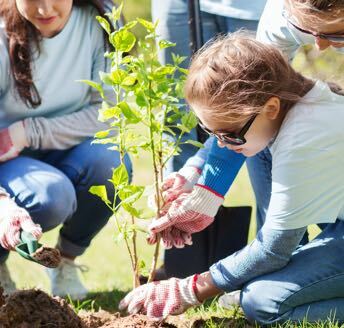 Only water when the soil is dry—and then follow our watering instructions and water the container thoroughly. If you are leaving town on summer vacation, create a watering plan for your time away! Ask a neighbor or friend to check on your containers every day and care for them as needed. 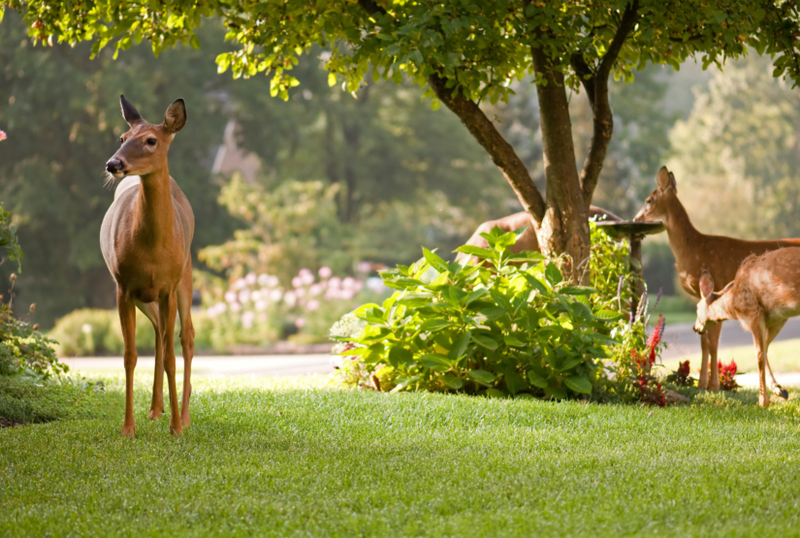 We recommend using a bloom boosting fertilizer to keep the blooms fresh all season. Miracle Grow Bloom Booster and Doctor Earth Bloom Booster, an organic option, stimulate new blooms and flowers and keeps them looking fresh in the summer heat. If you have a lot of containers, you can purchase one of these fertilizers with a hose end applicator to combine your watering and fertilization into one task. Lastly, make sure you deadhead the blooms as they die off in order to encourage further blooms and keep your container’s stunning appearance.